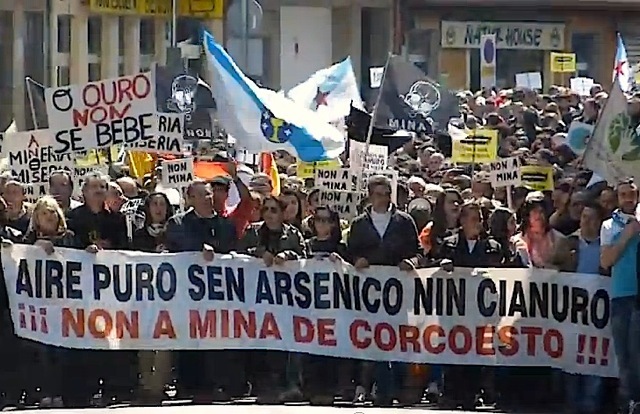 Last October, 15th, the controversial Corcoesto gold mining project in Cabana de Bergantiños (Galicia – Spain) was cancelled. This mining project had become the focus of a heated debate in Galicia over the last 15 months, mobilising thousands of people against it. Here we offer a summary of this successful environmental struggle. 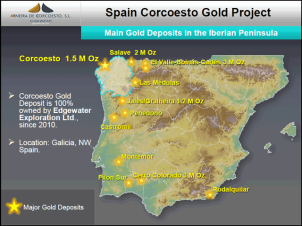 The Corcoesto gold project was aimed to be located in an area of 774 Hectares in the northwest of Spain, approximately 35 km from the city of La Coruña in the Autonomous Community of Galicia. This open-pit project was to operate over 13 years (including 3 years for infrastructure construction and 2 years for restoration activities), with plans to extract a total amount of 1,095,000 ounces of gold. Total investment would have been 651,824,167 € and of the project would have created 271 direct jobs during the 8 years of non-stop extractive operations. […] It is worth to mention the positive environmental impacts [of the Corcoesto project], linked to the Restoration Plan, as well as the socioeconomic benefits for job creation, economic investment, increase of wealth in the area and creation of public revenues from social security contributions, taxes and fees. (Edgewater, 2011: 20). However, gold mining is one of the most environmentally destructive forms of mining and it is vibrantly contested around the world (see campaigns such as the No dirty gold campaign, Save Rosia Montana Campaign or No a la mina en el Esquel). Open pit mining is one of the dirtiest methods of gold extraction found throughout the globe, which, among other impacts, poisons the environment with cyanide, fills rivers with acid mine waste, and contributes to the destruction of the mines’ surrounding ecosystems, with devastating results for local communities. In Corcoesto, the open-pit would have been located 140m from the Allóns River, a Place of Community Importance under the European environmental legislation. In fact, a mining accident such as a tailings spill, in the area, would have seriously affected Costa da Morte, an iconic environmentally protected area, recognized as a Special area for Birds. Obviously, the mining project would also have radically affected the people living in the area (in towns such as Cabana de Bergaintiños, Coristanco, Carballo, Concejo de Poristanco and Concejo de Ponteceso) in which small economies linked to cattle farming are still widespread (indeed 1000 small cattle farming businesses are located in the area of influence of the mining project). In 2012, the EIA presented by the company was approved and the project was declared an “industrial initiative of strategic interest” by the Galician regional government. This conservative regional government has been extremely keen to on the project development with “Job creation” as the magic word used by them to justify the controversial Corcoesto project approval; while its environmental and social costs have been shamefully downplayed. Opposition to the open-pit gold mine started in 2012. 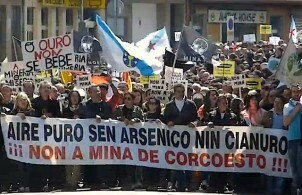 Since then, a lively anti-mining movement has been growing in Galicia. Several engaged individuals and different groups such as Salvemos Cabana, Adega, Verdegaia, Contraminate and Sociedade Galega de Historia Natural, among others, started mobilising against the project. For these groups, the Corcoesto project represented a clear example of environmental neo-colonialism, in which a Canadian company was going to exploit the land and the people, take the gold and leave behind environmental destruction and a toxic future for the people. Thus, these groups organised themselves in two Platforms (Plataforma Cidadá Salvemos Cabana and Plataforma pola Defensa de Corcoesto e Bergantiños, the latest composed by 23 groups), in order to coordinate all the efforts against the project and develop a more successful public campaign. According to the Platforma pola Defensa de Corcoesto e Berganiños, the company’s main strategy has consisted in targeting the local inhabitants in order to “divide and conquer” the community. Incentives included offering jobs, offering sponsorship for local football teams, or contributing to the local annual parties. During 2013, these two platforms have had a strong impact on the regional and national media. They have developed a complementary wide range of protest tactics; from writing official complaint letters; bringing the case before the Ombudsman and before the European Parliament (European laws encourage Member States to ban the use of cyanide for mining extraction); gathering 230,000 signatures against the gold mine; organising massive demonstrations in the main cities of Galicia; using international campaign tools such as change.org to make a viral youtube clip against open-pit mining in Galicia; they also explored the world of art-protest tactics by publishing a gold-mining protest poetry book and organizing a street art competition, theatre plays and a music festival. Additionally, more than 200 experts and other members of the regional government have taken a critical position against the gold mine, signing petitions and protesting against the project. On the 15th of October 2013, the regional government announced that the license for the gold mining project in Corcoesto was going to be cancelled. The regional government radically shifted its position and argued that the mining project lacked the necessary economic and technical requirements. These purely economic reasons together with the steady increase of public pressure have been the main factors determining the suspension of the project. In fact, over the last 12 months, the spread and the growth of the mobilization to the Corcoesto project has seriously eroded the Galician regional government’s image. The Canadian mining company will challenge this decision and will look for investors to start the bureaucratic procedure again and develop the open-pit project. Meanwhile the Environmental Justice groups celebrate this victory while they wait until the official announcement becomes reality. They are aware it may be only a temporal victory but they are ready to re-activate the struggle again if the company attempts to present the project again. – Web Plaforma Cidadá Salvemos Cabana. – Web Plataforma pola Defensa de Corcoesto e Bergantiños. – NEW UPDATE !! Press Release on the motion against Corcoesto mine.